Choosing the best softball bats is a difficult process but once you have the right information in your hand, you will be able to select the best one for you. Do you wish to be the best player in the field? Is your current bat hindering your performance? If yes, then you need to go through our comprehensive guide to find the right softball bats for 2019. We will start off by listing the top bats for this year. We have shortlisted are categorized separately into slowpitch and fastpitch bats so that you can quickly find one that is perfect for you. We hope that this list will let you find a bat that suits your batting style, budgetary requirements and other preferences. Finding the right bat may be somewhat hard as you have to consider a number of factors. We have made this easier by reviewing some of the hottest softball bats and shortlisting the ones that are the best in every way. One of the best 2019 slowpitch bats is the Super Z1000 Midload from Louisville Slugger. Midload bears the true quality and performance which is a hallmark of Louisville bats. The bat comes constructed with a composite barrel. Louisville has used an upgraded and enhanced LS-2X composite material in making the barrel, ensuring better performance and a larger sweet spot. It also means that the Midload bat is hot out of the wraps and requires little to no break-in period. Players can essentially start swinging it for a real performance right away. Super Z1000 Midload features a midloaded swing weight. This unique design feature ensures that the bat is able to transfer maximum amount of energy upon contact. Midload comes with 7/8-inch tapered handle which is topped with a synthetic leather grip. The slim profile and the grip ensure that the players are able to maintain a firm yet flexible grasp on the bat when swinging it on the plate. 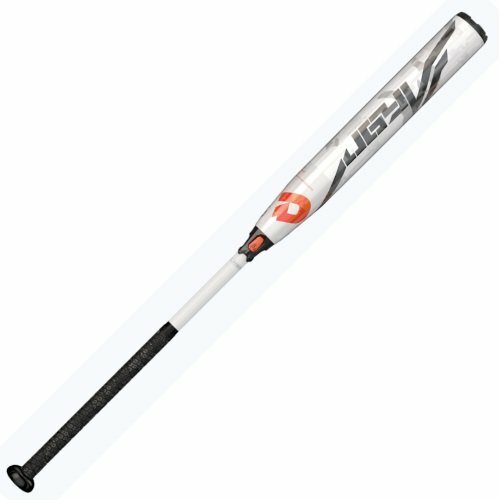 The bat is legit for use in USSSA, ISA and NSA matches. The DeMarini Nautalai is the flagship slowpitch bat from the company. This bat embodies the bold innovation and vision for which DeMarini is known. And it incorporates features which are sure to offer top performance in the hands of the player. DeMarini Nautalai has a fully composite design. The composite barrel has a Continuous Fiber Barrel Wall construction – this unique construction ensures that the barrel delivers a consistently optimal performance. The 13-inch barrel culminates in the Heavy D End Cap which adds to the swing momentum and hitting abilities of the barrel. DeMarini has used a 3Fusion composite handle in this bat. The 3Fusion technology ensures that the energy transfer is smooth between the barrel and the handle. The bat approved for use in USSSA, ISA and NSA. Worth is one of the well-recognized manufacturers in the softball and baseball industry. The company has been producing quality softball products for nearly a century and this long history of quality is manifest in this bat. Looking for the best USSSA softball bats? just don’t ignore this bat. The 2018 Ryan Harvey bat features a 2-piece composite construction. The barrel length of the bat is 13.5 inches. Worth has used cutting-edge technologies such as 220 Advantage and CF100 Tech in the construction of the barrel. This ensures that the barrel features a carbon fiber construction that is incredibly light-weight and yet very durable. The light-weight barrel allows for great swing speeds and optimal performance on the plate. The handle of the bat features Flex 50 technology. As a result, the handle is incredibly light-weight and yet offers a solid grip and feel. The two-piece construction of the bat enables the handle to bring a lot of whip effect to the bat during swinging. This adds extra momentum and power to the hitting prowess of the bat. The bat is approved for use in ISA, NSA, and USSSA. When come to the best ASA softball bats then DeMarini Wilson Sporting Goods Juggy OVL is among of them in this year. This bat comes from one of the most trusted and well-established companies in softball industry, DeMarini. DeMarini bats are considered synonymous with reliability, quality and performance. And this bat is no different. The Juggy OVL bat features a 12-inch barrel which is slightly smaller than the barrels of other bats on this list. However, despite the barrel length, the bat comes with a huge sweet spot with enough space to hit accurately and hard. The barrel features a 2X stacked double barrel construction which means that the barrel offers a great degree of flex. The extra flex lets you hit softball hard and far with the same amount of effort. The barrel of the bat leads into the 3Fusion handle. The two are joined together in a 2-piece design which routes back the feedback energy from the barrel into the sweet spot. At the same time, it reduces the vibrations on the handle. The handle ends in an ergonomically designed RCK knob which allows you hold a solid grip on the handle and comfortably swing the bat on the plate. The bat is end-loaded which gives you additional end-weight in the barrel to bring more speed and power to your swings. It is approved for use in ASA matches only. The list above includes some of the absolute best softball bats for slowpitch. Choosing one from these really depends on your personal style and preferences. The one-piece, composite Mizuno No Doubt bat, for instance, is perfect for power hitters who require a non-sense high-performer in their hands. On the other hand, if you rely on the flex and whip of the bat to hit far, the Easton Fire Flex may suit the bill better. Multi-piece bats are typically a good choice if you want the most flex out of a bat for home runs. The Miken Freak line-up requires no introduction. This line-up of bats has consistently featured some of the best slow pitch bats on the market. 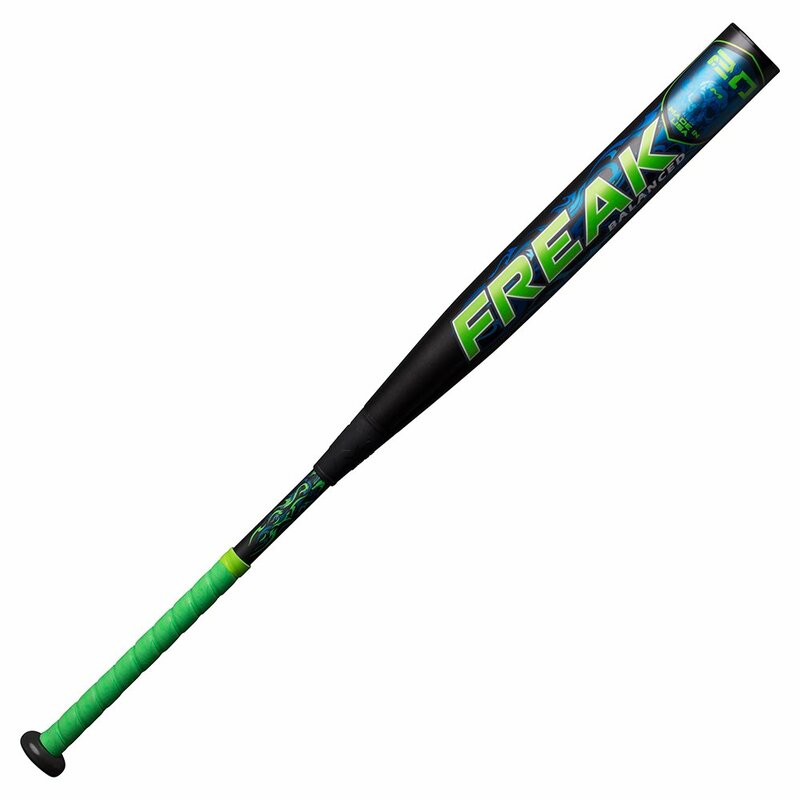 To add to this tradition is the 2019 Freak Pro Maxload which is an excellent option for the 2019 softball season. 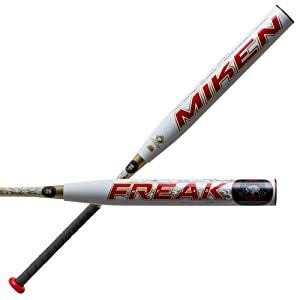 The Miken Freak Pro has been made from 100% composite materials. The bat has a two-piece design. The barrel diameter stands at 2 1/4 inches while it spans 14 inches in length. It offers a fairly large sweet spot for some powerful hitting on the field. Miken has used Triple Matrix Core + Technology as well as the Flex 2 Power Technology in the bat construction. These ensure that the bat remains durable while delivering optimal flex during hitting. The barrel of Miken Freak Pro features a 0.5oz endload. This makes it better suited for power players who can use the endload to their advantage. The bat is use in SSUSA and ISA. Miken MF20BA is another excellent slowpitch bat. This bat is rightly considered among the best composite slowpitch softball bats. Miken is noted for producing excellent slowpitch bats that combine optimal performance with great style and looks. This bat is no exception to these Miken traditions. The bat features a 100% composite construction which means that it offers all the superior features offered in a composite bat. The bat features a 14-inch barrel which offers a sizable sweet spot. The large barrel provides an explosive hitting potential and allows players to hit the incoming softball confidently and accurately. The overall design of the bat features a 4-piece construction which utilizes the Tetra-Core and 100 COMP technologies. The handle of the bat features Miken’s Sensi-Flex technology. This adds flexibility to the handle, enabling the bat to deliver a great whipping effect during swinging. The additional whip momentum allows you to hit softball harder and farther. The bat is balanced overall, so it is perfect for players who do not prefer end-loaded bats and are confident in their swinging prowess. It is approved for use in ASA leagues and is constructed in the USA. The 2018 Easton Fire Flex Loaded USSSA bat is another shortlisted bat among the top slowpitch bats of the year. Easton is renowned for manufacturing top-performing bats in softball as well as baseball. The company’s reputation is well reflected in the quality of this bat. The Fire Flex Loaded features a 13.5 inch long barrel with a barrel diameter of 2 1/4 inches. The barrel makes use of Easton’s trademark second-generation Flex barrel technology which brings more pop and optimal performance to the bat. 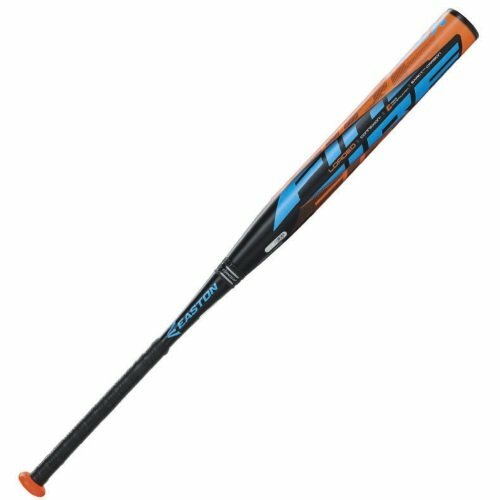 Crafted with cutting-edge engineering technologies and featuring an advanced EXACT carbon build, the bat offers a sizable sweet spot and plenty of flex for some hard hitting. The additional flex is possible thanks for the relatively softer barrel which combines durability with performance. The bat is ready for use right out of the wraps and requires no break-in period. The handle of the bat features a 100% composite construction. Between the handle and the barrel, Easton has used ConneXion+ technology that ensures a smooth feel when you are swinging this bat by reducing feedback on the handle. The barrel of the bat also features a one-ounce end-load which gives additional momentum and speed to the players. The bat is approved for use in NSA, USSSA and ISA. The Mizuno Nighthawk Slow Pitch End Load Softball bat is one of the best end loaded slowpitch softball bats this year. Mizuno is reputed for producing quality softball bats year after year, and this bat is testament to the company’s commitment to quality and excellence. 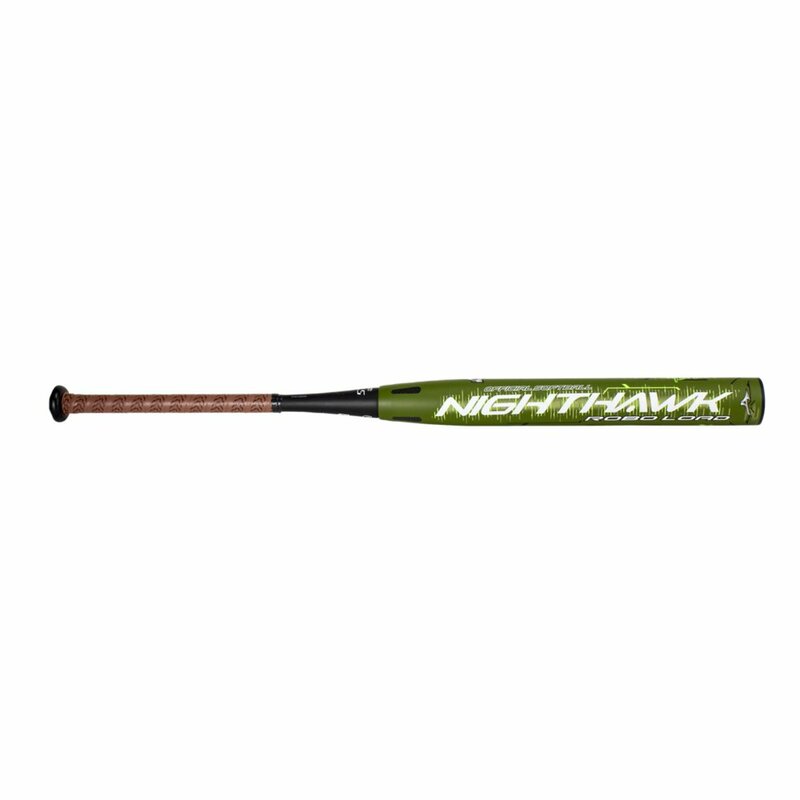 The Nighthawk bat comes constructed from a black Onyx composite barrel and a thin carbon fiber handle. The two pieces of the bat are connected using the advanced 2-piece link technology which immensely reduced feedback vibrations on the handle. The barrel itself has a triple wall design which brings an exceptional degree of flex to it and lets you hit powerfully when wielding it. To add to it, the thin carbon fiber handle adds a great deal of whip effect which brings additional explosive power to your hits. The barrel of the bat features a sizable sweet spot, making it easy to hit accurately and confidently. The bat is ready for use right out of the wraps, so it needs to break-in period. The bat is end loaded and carries a 3/4 ounce end load. The end loads adds more momentum to your swings and let you target the incoming softball with greater power and speed. The bat is approved by ASA, USSSA, NSA and ISA. When it comes to quality fastpitch softball bats, it’s not possible to proceed without mentioning DeMarini. The company has a reputation for delivering high-performance bats through constant innovation – and this quality is well reflected in the DeMarini 2019 CF Zen. DeMarini has impeccably designed its CF Zen line-up with premium materials, cutting-edge design and a number of additional features. The bat’s barrel has been constructed from Paraflex+ Composite material. Paraflex Composite material is instrumental in creating a bat that is able to deliver an excellent degree of flex to hit the softball hard and far. The 2 1/4-inch barrel is manufactured so that it offers a sizable 360-degree sweet spot. This ensures that you are able to hit right with the barrel no matter which side you use for hitting. The bat has a perfectly balanced feel overall. This helps the players achieve better control the bat on the plate. DeMarini has used 3Fusion System in bringing together this bat. This system joins together and streamlines the bat from its end cap all the way to the knob. It also maximizes the channeling of swing momentum into the barrel. CF Zen -10 is available in a variety of sizes. No list of top fastpitch bats is complete without a mention of Easton. The company is included among the top manufacturers of fastpitch bats because of its commitment to quality, performance and durability. The Ghost Double Barrel bat from Easton features a revolutionary double barrel construction. Easton has used XTX Xtra Tough Resin Matrix technology in making this bat. Thanks to the Matrix technology, the outer barrel has minimum compression, offering maximum flex, while the inner barrel provides excellent durability at the same time. The barrel is connected to the handle using ConneXion technology and a NITROFOAM – together, they ensure that handle and barrel are seamlessly connected for a better hitting experience. Ghost Double Barrel bat has a barrel sized at 2.25-inches. The handle’s profile is 29/32 inches with a 1.2 mm Hyperskin Grip. The bat has a length-to-weight difference of 10. Available in a variety of lengths, you can choose from 30 inches, 31 inches, 32 inches, 33 inches and 34 inches. The weight ranges from 20 ounces to 24 ounces. Louisville Slugger is a brand that is often identified with top performances in league matches. This is simply because the Slugger bats are often endorsed by many big names in the softball sport – and for good reason. Louisville’s fastpitch bats are some of the best on the market. The Xeno X19 is no different – this is definitely one of the best fastpitch bats for the 2019 season. The bat is constructed entirely from premium-grade composite material. The barrel and handle are separately designed, making this a 2-piece bat where the handle and the barrel are jointed together through the IST XStiff technology. The IST connection ensures that the maximum amount of energy is channeled from the handle into the barrel while mitigating feedback vibrations. The bat is ready for use and requires no break in period. Louisville Slugger has used S1ID Barrel Technology in the bat’s barrel – this ensures that the barrel delivers a consistent performance with enhanced pop upon contact. The barrel of Xeno X19 has been topped with an X-shaped end cap. The end cap improves the overall balance and durability of the bat while also adding to its swing speed on the plate. The bat has a minus 10 weight drop. Rawlings is one of the oldest and most well-established manufacturers in the baseball and softball industry. The company has been creating sports products for more than a century and its name is a trademark for quality and performance. This year, the company has lived up to its reputation with the Rawlings Velo Fastpitch bat. This bat comes constructed from composite material which brings optimal performance in the hands of the players. Rawlings has used a two-piece design in this bat. The two-piece construction brings together a flexible barrel and a stiff handle. The result is a great degree of flex in the barrel and the additional whip effect which lets you hit hard and far with this bat. The bat is 29 inches long and features a weight drop of -11. The barrel is 2 1/4 in diameter. Rawlings has used ultra-light carbon fiber material in the construction of the bat. As a result, the bat features an exceptionally light-weight profile which enables great swing speeds. To make the swinging experience even smoother, the barrel also comes with a Comp-Lite end cap which ensures the overall balance of the bat. The bat is approved for use in ASA, USSSA, ISF, ISA and NSA. It is available in multiple color options including Red, Black and White. If you are looking for a great fastpitch softball bat that not only delivers performance but also comes with great style and looks, this may be the one for you. This bat from Anderson combines optimal performance with durability, quality and unique looks. 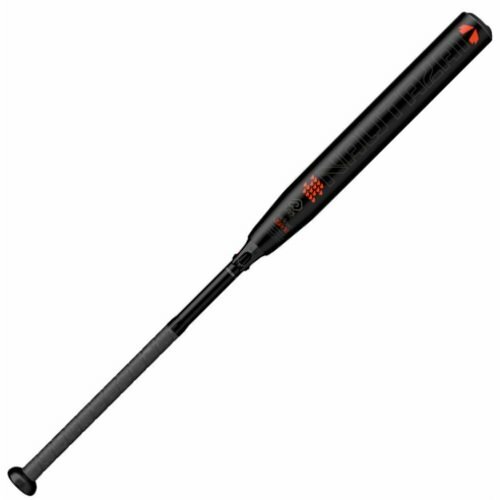 The bat is constructed from aerospace alloy and Anderson has used a multi-wall design in the construction of the barrel. As a result, the barrel delivers a solid punch and lets you hit softballs all over the field. The 2 1/4 inch barrel features power arch technology of Anderson and promises to deliver optimal performance in all seasons. The bat has an end-loaded overall design. This makes the bat perfect for power hitters who not only want a solid barrel but also the additional swing momentum offered by the extra load. The handle comes with an ultra-thin whip design which lets you swing the bat at great speeds. To top it, the handle has a soft and durable grip which ensures that you are able to grasp the bat firmly while reducing the feedback vibrations at the same time. The bat is ready for use right out of the wraps, so you don’t need to spend any time or effort in breaking in the bat. Rocketech is approved for use in ASA, NSA, ISA, USSSA and NCAA matches. Every year, a huge range of fastpitch bats arrive in the market. We’ve tried to make the task of choosing easier for you by shortlisting the best softball bats for fastpitch. However, at the end of the day, the right bat for you really depends on your own budget, preferences, hitting style and other requirements. If you are a power hitter and rely on your own hitting prowess to hit the softball, the solid Anderson Rocketech bat is a great choice. On the other hand, if you want a barrel with extra flex, a composite bat such as the Mizuno Ghost is the perfect option for you. The two popular games of softball are – slow pitch softball and fast pitch softball. Although the two games are quite similar yet there are some major differences between the two. To start off, slow pitch softball bats have a prominent and separate barrel that has a large surface area. This big sized barrel allows for a greater sweet spot. Secondly, slowpitch softball bats are heavier in weight as compared to fastpitch bats. The weight usually ranges between 26oz and 30oz. As far as the length of slowpitch bats is considered, it is the same as that on fastpitch bats with a maximum length of 34 inches. These bats can be made up of composite, aluminum, alloy or wood material. They can have a one-piece, two-piece or a three-piece construction. The barrel on slowpitch softball bats can be single walled or double walled. The weight on the barrel can be balanced or end-loaded. Fastpitch softball bats, on the other hand, have a narrow and more streamlined construction. The barrel on these bats is not separated from the handle. These bats are light in weight with an average fastpitch bat having a weight between 23 ounces to 28ounces. Batters in this game have a very limited reaction time, so they need to swing a bat that is light in weight. Fastpitch softball bats can be 32 to 34 inches long. They are constructed using a variety of materials including composite, aluminum, alloy and wood. If you recently purchased a softball bat then you must have noticed that it has markings that say USSSA, ASA or ISF. These markings are basically stamps of approval that allow you to play in the given league. Different bats are approved for different associations. You cannot use an illegal or unapproved for a certain softball association. While there are around 20 certified softball associations, the popular ones are – High School, ASA, NSA, ISF, ISA and USSSA. Based in Oklahoma, Amateur Softball Association was amongst the first ones to set out rules for the game of softball. Today, they have more than 3.5 million players. Their rules were made to ensure the safety and comfort of the players as well as to allow for a fair competition amongst the teams. United States Specialty Sports Association (USSSA) started off in 1968 with the intention of altering the prevalent governing rules. It was focused on slow pitch softball initially. Later, it provided rules for fastpitch, baseball, basketball and golf as well. While the two look quite similar, there is a difference between the design of a slow pitch and a fast pitch bat. The major differences between the two bats have already been discussed above. Here, we are talking about the specific design of a softball bat. This can include color and the shape. In our opinion these factors play the least important role while selecting a softball bat. We would never recommend you to choose a certain bat just because you like its color or that your teammate likes its design. One of the most important aspects of a softball bat is its weight. It varies among models and it’s totally a matter of your personal preference. For players who are physically strong, swinging a heavier bat is not an issue. But this isn’t always the case. You must keep in mind that there is a tradeoff between swing speed and inertia generated. A lighter bat generates faster swing with less inertia. On the other hand, a heavier bat will not give you enough swing speed but it will generate plenty of inertia. When it comes to softball bats, their weight is given in terms of drop weight. So, if you are looking at bat which is 30 inches long and it has a drop of -10, it will weigh 20ounces. A lightweight bat tends to have a higher drop weight. You will find a variety of drop weights including -8oz, -12oz and -15oz. Going for bats that weigh a lot isn’t really a good idea. It reduces swing speed and is not comfortable to hold. Choosing the right softball bat length is an important aspect. In order to determine the right length, you need to first measure yourself properly. Once you have taken your right measurements, you combine them with your weight and this combination will give you the appropriate bat length. For instance, anyone who weighs more than 120lbs and has a height around 6 feet should go for a bat with a length around 33-34inches. If you are looking for a softball bat for your child who weighs less than 60lbs, you should pick a bat length of around 26 to 29 inches. The biggest part of a softball bat, the one that makes contact with the ball, is known as the barrel. There are typically no rules set out for the size of the barrel. A big sized barrel is generally thought to be better as you get more surface area. But this is associated with additional weight. As far as the diameter of the barrel is concerned, it is the same for all softball bats that is 2 ¼ inches. The connecting area between the handle and barrel of a bat is known as taper. You can think of it as a smooth transition between the two most important elements of your bat. A taper diameter is 31/32nds of an inch. For someone who likes to swing their bat to a greater extent, a good option is to go for a narrower taper. Such a taper assists in achieving greater swing speeds. A thicker taper helps in reducing vibrations. The kind of taper you want is again your personal preference. When it comes to choosing a softball bat, you need to look for comfort as well. Grip is one of the add-ons which offer comfort and a great feel. Placed between the knob and the taper, a grip is normally 10 to 15 inches long. It can be made up of leather, rubber or synthetic material. Generally, a rubber grip is preferred. It offers greater shock resistance. Leather or synthetic material, on the other hand, provides a firm grip. You should hold a bat in your hand and try to feel the grip in order to make sure if it is comfortable or not. An End Cap is an extra item attached at the end of the barrel. It is a standard on most softball bats and is deemed compulsory by most softball associations. It is basically inserted at the end of the barrel where it allows for an even distribution of your bats weight. It also keeps the interior part of your barrel safe. A disadvantage of these end caps is that they tend to get damaged overtime. A good thing about end caps is that they can be easily repaired or replaced. Be sure to check with your association if replacing or repairing of end cap on your own is allowed! A knob is attached to the end part of bat which prevents it from slipping. It also assists in correcting your swinging mechanics. If the weight of the knob is increased you tend get a faster bat speed. You are able to get a whip-like motion in your swing. A heavier knob is preferred for beginners who are in their training phase. It is also promotes muscle memory as well. In the previous part, we discussed the important features that you need to look for in a softball bat, now we look at some of the other factors that you need to decide upon before purchasing a softball bat. To start off, you need to know the league that you wish to play for. Every league has its own set of rules that you need to abide by and therefore you cannot simply use any bat of your choice for a certain league. Every softball bat has a stamp of approval on it that allows you to play in the mentioned league. So, if you wish to play for USSSA or ASA league then make sure your bat is USSSA or ASA certified. We have also listed the rules and regulations of some of the popular leagues in the next section. They will be useful for you in many ways. If you think that slow pitch and fast pitch softball is the same thing, then you my friend are mistaken. They are two different games that require different equipment. As the name suggests, softballs in fast pitch game are pitched at speeds greater than 50mph. You need to decide which game you wish to play. Manufacturers make specific bats for both leagues by keeping in mind the needs of the two. You can easily find a slow pitch or a fast pitch softball bat in the market. While you can use a slow pitch softball bat in a fastpitch softball game, it is not recommended. Durability is an important factor that you should keep in mind before buying a softball bat. You have a peace of mind when you have a durable bat on your hand. Your bat should withstand more than 150 hits as once you become comfortable with a certain bat you don’t want to change it. Changing bats every now and then certainly impacts your performance. Some bats are prone to breakage and denting. You should check out the reviews and personal experiences of players before you buy a certain bat. Ask them how well their bat performs over 150 hits. Certain materials make your bat more durable. Which material is the best for you? Let’s discuss this point in detail in the next part. Introduced in 1970s, Aluminum bats are made up of aluminum and are known to be better at performance as compared to wood bats. Aluminum bats are extremely durable and long-lasting. While aluminum bats are considered to be light in weight, composite bats are even lighter. Another good thing about aluminum bats is that they are very affordable which makes them a budget friendly option especially for beginners. Sadly, the vibrations on aluminum bats do not get dampened easily. As there are more vibrations, mishits usually sting a lot more in aluminum bats. Whenever you hit an aluminum bat you tend to hear a “ping” sound. Finally, these bats are prone to denting after 100 hits. Composite softball bats are made up of complex materials including graphite-fiber and epoxy resin. These bats have gained a lot of popularity over the years. They are lighter than aluminum bats and are known to have greater flex. The sweet spot on these bats is also large as compared to its counterparts. These bats usually use newer and innovative technologies which assist in reducing sting and dampening any vibrations as well. Unfortunately, composite bats are a bit expensive. They should not be used in extreme cold weathers. A major downside to these bats is that they require break-in period. This means that you need to hit your bat around 150 times in order for it to reach its optimal performance. Considered as the classic, Wood softball bats were the first ones to be used in softball game. A wood bat can be made up of ash, maple or bamboo wood. Such a bat is the strongest amongst all. It is the most durable as well. But with strength comes weight. Wood substantially increases the weight of these bats. Wood bats that are made out of maple are the stiffest which means that it is the least flexible. Maple bats are perfect for professional hitters who are looking for powerful hits. Ash bats on the other hand are quite flexible but they are prone to breakage as well. Wood bats are generally cheaper than aluminum or composite bats. When aluminum is mixed with other metals, you get alloy bats. These do not require any break-in time and are hot out of the wrapper. They are very affordable as well. Unlike composite bats, they can be used in any weather conditions. On the downside, these bats tend to have smaller sweet spot and have more vibration as well. Whenever there is a miss-hit your hand feels an intense sting. Which material is the best? It totally depends on your need and your preference. If you are looking for a bat that has a bigger sweet spot and a greater flex, then a composite bat is what you need. If you are on a budget and durability is your concern, then an aluminum or alloy bat is what you require. A heavy softball bat slows down your swing speed. When you don’t have a fast enough swing you don’t hit homeruns. So, a heavier softball bat is generally not the best one for you. Professional players use both light and heavy bats. There is no set standard out there. Your physical strength is relevant here. If you are stronger, then you might want to go for a heavier softball bat. You might want to check whether a bat is suitable for you or not before purchasing it. Hold the bat and extend your arm for half a minute. If this does not stress you out and you don’t drop it then this bat will work for you. As far as the weight of a softball bat is concerned, there are two types – balanced and end loaded. The total weight in a balanced bat is evenly distributed throughout the bat. These bats are faster and offer a better control. It is most suitable for contact or base hitters. You tend to get a smoother swing with this type of bat. The Moment of Inertia (MOI) is also lower on these bats. You might want to hold both balanced and end loaded bats one by one and swing them in order to get a better idea of what you are comfortable with. End loaded bats, on the other hand, have a large amount of weight concentrated on the end of the barrel near the end cap. This extra weight in the end allows the batter to have more momentum while swinging the bat. Hitters who are physically strong and are looking for more power may benefit from end loaded bats. The end load in the barrel can range from 0.5 ounces to 3 ounces. Due to the top-heavy barrel, these bats are usually difficult to handle. Again, it is your personal preference whether or not you want an end loaded or a balanced bat. There are generally two types of barrels – single wall and double (multi) wall barrels. A single wall bat has a single wall barrel. This type of bat is used by players who play for leagues that have stricter restrictions. These bats have their pros and cons as well. The main advantages of these bats are that they are safe; they offer decent performance, are durable and are easy on the pocket as well. Unfortunately, the batted ball speed on these bats is low and they lack the pop that is generated on double wall bats. The good thing is that you can find some amazing quality single wall bats in the market including the popular DeMarini steel. Double wall or multi wall bats have barrels with double walls. These added layers of walls increase the trampoline effect and the batted ball speed is higher as well. The flex generated on these bats is way more than that generated on single wall bats. Due to the fast batted ball speed that these bats generate, they are considered to be one of the dangerous softball bats. As there are multiple layers in these bats, they are considered more durable and long-lasting. If you don’t have any single wall restrictions, we recommend you to go for double wall bats. They are way more flexible and user friendly. A softball bat can have four different types of construction – one piece, two-piece, three-piece and four-piece. All of these types have their advantages and disadvantages. As the name suggests, one material is used to make one-piece bats. They have no breaks and both the handle and barrel have the same structure. Being one-piece, these softball bats are more rigid and are suitable for power hitters. You cannot expect a one-piece bat to flex in a way the others do. It is stiffer and does not give the trampoline effect you are looking for. One the other hand, one-piece bats give more power as no energy is lost at the time of contact with the softball. According to some users, one-piece bats sting a lot more in case of mishits. This is because of the absence of trampoline effect. Our general observation is that senior and more advanced players prefer one-piece bats. If you are looking for a hybrid bat that is experience the power of two materials in one bat then you definitely need a two-piece bat. A two piece bat has a separate handle which connected to a separate barrel using some technology. These bats can be constructed using two different materials or a single one. For instance, you can have a two-piece bat with composite handle and an aluminum barrel. Such a bat is commonly known as hybrid bat. Two-piece bats have more flex to them and they have a larger trampoline effect. They offer less power as compared to one-piece bats. As there is greater flex the vibrations are reduced. This means that whenever there is a mishit the sting is dampened. With three piece bats, there is an additional item attached between the barrel and the handle. The most popular three piece bats are manufactured by Louisville Slugger. The company uses TRU3 technology whereby elastomeric connection system is utilized in order to make a connection between the handle and the barrel. Three piece bats have amazing flex and vibrations are partially absorbed as well. Although four piece bats are not widely available in the market yet there are a few popular ones which are loved by their users. Worth 2 Legit is a super four-piece softball bat with amazing flex and great pop. It has four parts – inner barrel, outer barrel, collar piece and a handle. So which piece softball bat is the most suitable for you? In order to make this decision you need to understand the type of hitter you are and your batting preferences as well. For someone who is looking for power and an experience which mimics wood bats then a one-piece bat is what you need. If you want a smooth feel, dampened vibrations and more flex, then a two-piece bat is your best bet! The swing weight or the moment of inertia (MOI) plays an important role in the swing speed of your bat. It is not the weight of your bat but the MOI that impacts your swing speed. As a rule of thumb keep in mind that the higher the moment of inertia the slower is your swing speed. Unfortunately, the swing weight is not provided by many manufacturers and this causes a lot of issues while selecting a softball bat. This completes our explanation of the important features linked with softball bats. Let us now look at the some of the rule and regulations of popular softball associations. As the market for slow pitch and fast pitch softball bats is growing, the number of sellers is simultaneously increasing as well. Choosing the best bats might be a cumbersome process, but once you know the top brands you can easily narrow down your options. A California based brand, Easton is known for providing top-quality softball bats for more than 40 years. The company believes in constant innovation. Their two-piece bats feature IMX Composite Barrel which uses ConneXion+ technology for a solid feel and an increased performance. Easton produces long-lasting and durable bats that will survive more than 1000 hits. Their slow pitch softball bats are extremely affordable making them a great option for beginners. The latest 2018 Ghost series fast pitch softball bats from Easton are set to offer maximum pop, explosive sound and a comfortable feel. Previously, Easton’s Stealth and Mako series softball bats remained a favorite amongst the batters. Based in Oregon, United States, DeMarini is a world famous softball bat manufacturer. The company claims to be the maker of world’s finest bats. In the past, DeMarini’s Divergence technology increased the performance of their bats by extending the sweet spot. These bats are powerful right out of the wrapper. They have unmatched sturdiness and amazing feel to them. DeMarini CF9 Series fast pitch bats are the most loved softball bats. While these bats are on the pricier side, the features that they offer are definitely worth your money! With a rich history of 132 years, Louisville Slugger is renowned for leading the game with its innovative softball and baseball equipment. Their TRU3 technology is one of the most innovative and popular 3-piece technologies present in the market. The Xeno, LXT and PXT fastpitch softball bats from Louisville slugger are the most popular ones in the latest 2018 lineup. Every softball association has a set of rules that its players follow. If you don’t follow these rules, you are basically not allowed to play in a certain association. One of the most popular high school softball associations is NFHS – National Federation of State High School Associations. The rules set out by NFHS are generally followed by other smaller associations. According to 2016 NFHS Softball rulebook, a slow pitch or fast pitch softball bat should have a maximum length of 34 inches and a barrel diameter of 2 ¼ inches. Furthermore, a bat that has ASA 2002 or 2004 stamp on it is approved for play in high school softball leagues. You can check for the non-approved bats on the ASA website. Wood bats that you use in NFHS leagues do not require any stamp of approval. Each bat should have a safety grip and an end cap. The size of the grip should be between 10 and 15 inches. The barrel needs to have a smooth cylindrical shape and a solid transition to the handle (taper). All of the above mentioned bat rules and any other specified by your high school softball association should be taken care of. The Amateur Softball Association sets out rules and regulations for both slow pitch and fast pitch softball. It includes rules for the players, the field and the equipment as well. According to ASA, a bat is legal for play in slow pitch softball if it has a stamp of approval which says “ASA 2000” or “ASA 2004”, if it has a maximum length of 34 inches and if its weight is less than 38 ounces. Additionally, the barrel should be smooth, free from dents and should have a diameter no more than 2.25 inches. The bat can be made up of wood, metal or composite material. An ASA softball bat should have a safety grip that is no longer than 15inches. It can be made up of cork or composite material. There should be an end cap and a safety knob as well. Any bat which is altered or has removable parts is deemed illegal by ASA. The official website of ASA has a list of approved and non-approved bats. You should definitely check out this list. The manufacturer should mark a certain bat as “OFFICIAL SOFTBALL”. According to 2017 United States Specialty Sports Association (USSSA) rules for slow pitch softball, the official bat should have a maximum length of 34 inches. The bat should consist of a knob which is attached to the handle and a barrel that has a maximum diameter of 2 ¼ inches. The overall weight of the bat should not be more than 31 ounces. A tape grip that is minimum 10 inches long should be attached to the handle. The bat should have a permanent USSSA marking. Damaged and abused bats are not allowed for play in slowpitch softball USSSA leagues. Same rules apply to fastpitch softball games. Keep in mind that your bats should have performance standard of BPF 1.20. Wood bats, however, do not require this standard. If you have recently developed interest in slowpitch or fastpitch softball, then you might have a number of questions in your mind related to the game. Give below are the answers to some of the most frequently asked questions regarding the game of fastpitch and slowpitch softball. 1. What is Softball Bat Drop? Softball Bat Drop is basically the difference between the length and the weight of a softball bat. Most of the time, it is used to represent the size of a bat. Some of the examples of bat drop include -8oz, -12oz and -15oz. The length of a certain softball bat is taken in inches while its weight is represented in terms of ounces. As a rule of thumb, remember that a bat is lighter in weight if its drop is higher. A -12oz softball bat will weigh lighter than a -8oz bat. 2. Can You use Slow Pitch Softball Bats in Fastpitch? As the pitch speed differs in the two games, bats designed for slow pitch softball are different from that made for fastpitch softball. Slowpitch sotball bats are designed for sluggishly hitting the ball that is travelling around 25mph. They are a lot heavier in weight (some bats weighing as high as 30ounces). According to a renowned Physicist from Pennsylvania State University, a slow pitch softball bat can be used in fastpitch softball. Such a bat is able to withstand fast pitches and it won’t get damaged. On the flip side, the heavy weight on a slow pitch bat is most likely to compromise your performance and will slow down your reaction time. Although you can use your slow pitch softball bat for a fastpitch game yet it is recommended to use the right bat for the right game. 3. How to care for Slow Pitch Softball Bat? Unfortunately, slow pitch softball bats have finite amount of hits so you need to take care of them. To start off, you should use dry leather softballs that have a compression rating of 500lbs or less. Anything greater than this and your bat will be prone to dents and breakage. Rubber balls in the cage or wet balls that weigh a lot should be avoided at all costs. In today’s world, most of the aluminum slow pitch bats don’t require break-in. They are hot out of the wrapper. Same is not the case with composite bats. They require break-in period which is usually around 150-200 hits. You should hit a softball off a tee for break-in period. It is advisable to rotate your bat ¼ turn every time you hit the ball. This way your bat gets broken in evenly. Techniques like vising or rolling that accelerate break-in period should be avoided at all costs. These are illegal and they contribute to damaging your bat. Don’t let others use your bat, as the more hits your bat takes the quicker it is expected to lose its performance. Finally, you should store your bat in a proper storage space where the temperature is normal. Extreme temperatures adversely impact your slow pitch softball bat. 4. Can you use Softball Bats in Cold Weather? Composite bats are known for being sensitive to low temperatures. This means that you should avoid using your composite bat in temperatures below 55 degree Fahrenheit. When it is extremely cold, softballs tend to expand. This added weight increases the likelihood of your bat getting damaged. Every softball bat comes with certain temperature guidelines provided by the manufacturer. Be sure to check them before using your bat in cold weather. 5. How to Clean Softball Bats? If you want your softball bat to look as good as new again, then cleaning it is an important step that you should take. You can easily wipe off any loose dirt that has been accumulated on your bat overtime. Once you wipe any excess dirt, then you can softly scrub your bat with mild dish soap and a soft cloth. Make sure to use a light hand. After cleaning, you can dry your bat with a soft towel. You should keep your bat away from any harsh abrasives or strong penetrating chemicals. 6. How to pick Softball Bat Length? There isn’t a lot to choose with Slow Pitch Softball bats as they are 34 inches long. This is the standard for all the slowpitch bats. Same is not true for fastpitch bats. In order to determine the length of a fastpitch softball bat, you need to take into account your height and your weight. For someone who is around 5 inches of height, a bat length between 30-32inches is the most suitable. You can take help from the bat length reference charts that are available online. 7. How to increase Softball Bat Speed? You need to focus on the ball and follow through in order to perform a smooth swing. Other than correcting your body mechanics, you need to do drills that will help you in achieving a faster swing. For this purpose, we recommend you to reach out to your coaches and ask for their assistance. Finally, in order to increase bat speed you should build your body strength. By strengthening your muscles you are able to swing the bat in a better way. This involves working out with your legs, tightening up your grip and strengthening your side abdominals. Stay as energetic and healthy as you can. 8. How is Softball harder than Baseball? The softball field is much smaller than that of baseball. It is typically 60 feet. The reaction time in softball is much lesser as compared to that in baseball. If a softball is pitched at a speed of 90mph, the batter gets only 0.2 seconds to see and react to this pitch. An extremely fast reaction is demanded from the batters making softball much more difficult as compared to baseball. The mound on the softball field is flat which means that the batter has to put in extra effort in order to hit the raised pitches. Although baseball is smaller yet baseball bats have bigger barrels which allow the players to hit the ball in a better way. You can also find the difference between baseball and softball bats at here. 9. How to fix Softball Bat end cap? The end cap of your softball bat tends to get damaged due to the large amount of abuse that your softball bats go through. This might also occur because of a manufacturing default. Whatever the reason is, you can easily fix the end cap. You require urethane epoxy for this purpose. Put a thin layer of this adhesive on the inside of the barrel. You need to have an even layer of the epoxy in order to ensure a perfect fit. Once you have applied the epoxy, you can then fit in the end cap. Let the epoxy set for 24 hours. Once it is dried make sure that your end cap fits perfectly. Swing your bat several times before going out in the field. We started off by providing you the best softball bats 2019 then we moved onto a comprehensive softball buying guide. All the important factors that you need to consider before purchasing a softball bats were also included. We looked at the top brands and the rules and regulations of top softball associations. We also gave in-depth answers to your frequently asked questions. At this point, we hope that you have a fair idea of all the elements associated with softball bats. While hundreds of softball bats are manufactured each year, only a few of them become the top rated. These bats are known for their quality, durability and overall performance on the field. Given below is a table which shows the top rated softball bats for 2019. These are tried and tested by many and have become an absolute favorite.